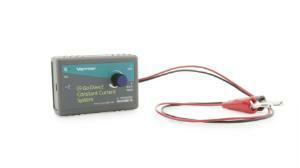 DC power source with a built-in current probe designed for use in electrochemistry experiments. Use the Go Direct Constant Current System to determine Avogadro’s number and perform various electroplating and electrolysis experiments. This system combines a DC power source with a built-in current sensor to eliminate the need for a separate power supply, and it can deliver up to 0.6 A at 5 V DC. Voltage settings are automatically adjusted to complement the chosen current setting. Our Go Direct Constant Current System connects directly to your mobile device, Chromebook, or computer using our free Graphical Analysis 4 software—no additional equipment or software purchases are necessary. Go Direct Sensors can be used wired via USB or wirelessly via Bluetooth, allowing you to choose the solution best for your classroom or laboratory.